what's the finest thinnest line you can mark onto a glass using a 45 watt CO2 laser? I didn't know either. common practice with glass is to mark it with raster art to "etch" it. that gives a pretty clean line. but in a lot of materials, a vector line done with very cool settings can give an even cleaner line. but vector work can be hotter so you gotta start much cooler and be concerned about cracking the glass. so I tried. my first several attempts didn't mark the glass at all or else were just enough to burn off the finger print oil. good - at least I had room to work. the vector lines came out looking terrible, like I'd tried to lay down a bead of glue with an unsteady hand. I'd never seen glass look like that so I salivated to enlist my closeup lens. 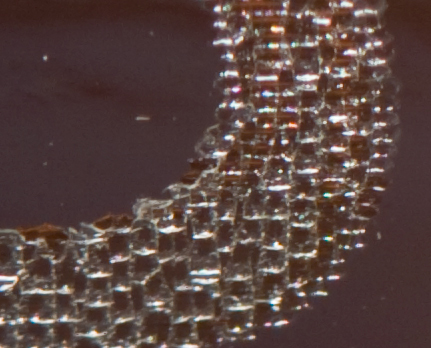 below is a closeup of glass affected by vector and raster artwork. left to right: etched "m", two very close vector lines, two more very close vector lines, good looking raster line, followed by three different vector lines. above and below, you can see the vector lines with more irregular markings. 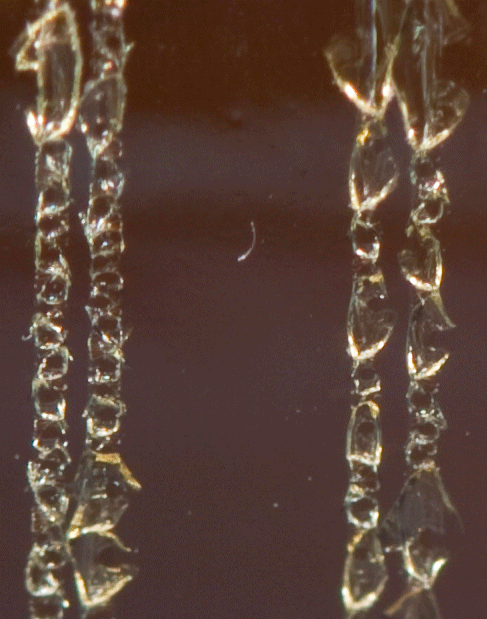 they look like strings of jewels, or maybe glass that's fractured sideways into a drip shape. the raster seems a lot more regular and dense. above, closeup of the "m" raster. above, closeup of the vectors. for scale, the whole bottle. 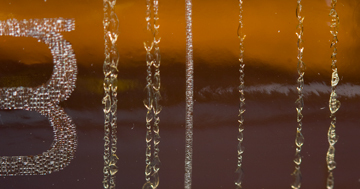 and after all that, the raster line retained its regal position of making the best line in glass. 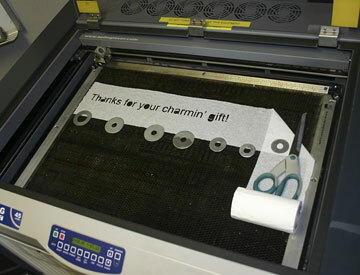 in case you've ever wanted to know, the Epilog will interpret any vector outline thinner than 0.5 pt as vector. 0.5 point is the smallest thickness that can be treated as raster. and I know some of you are going to ask what's the difference between a hairline specified vector and, say, one specified at .3? probably nothing. 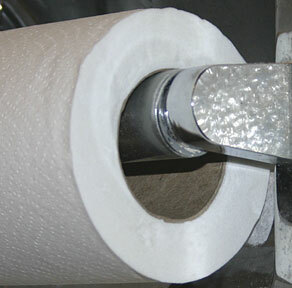 what statement could we make with 5000 etched or cut toilet paper innards? I'm dying to create something but it would have to make a strong statement - beautiful or entertaining or something having to do with recycling. and these rolls are just not speaking to me. I know ... maybe that's a good thing. but i'm inspired by things like Tara Donovan's work where she takes a common everyday item - lots of them - and displays them in a very stunning way. all you readers I'm seeing from over at missionmission - if you could, what statement would You make with a million toilet paper innards? see past post for more tp laser info. FINALLY, I achieved something I've been thinking, salivating, dreaming of doing for over a year now - laser etch SomeThing on the innard of a toilet paper roll. can you see it? that's not Jesus or his mom. that is me. there, I said it, put it on the web, it must be true. no, really. I saw it etch out with my own eyes. and the picture is enhanced a bit so it shows up better online although this material doesn't darken much. so why did it take me so long? I just had to build a little jig to hold it. needed to make it heavier so it would turn properly. 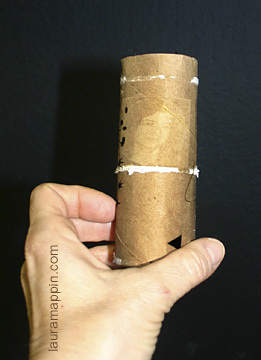 but the photo is wider than it should be because the jig has a narrower diameter than the roll. 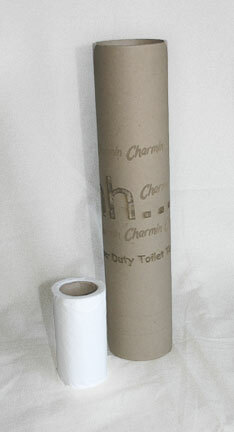 will improve it so the turning radius matches the toilet paper roll - or make my artwork narrower next time. I just noticed that the last several posts I've made are all phallic-focused. Yeah, they are fun little creatures, they appear out of nowhere in thought and sometimes otherwise. But really, there is more to life. Even mine. I was preparing materials for a light holiday-focused fun laser class a few days ago, playing with spray paint and acrylic. I was showing a friend the series, "I started with this plain snowman here but you know me, I can't leave well enough alone." He replied, "So you moved the carrot nose down to his crotch?" "Heyyy, that never occurred to me." And it was true. I put my face on it, of course! This page is an archive of recent entries in the Materials category. How-to's is the previous category. Public talks is the next category.